Yesterday was National Doughnut Day, apparently. So we made doughnuts. At the request of a few folks on instagram, here’s the recipe I used. We make our doughnuts in a mini doughnut maker but you could easily adapt this to a doughnut pan and bake them. This recipe is very flexible and can be adapted to use ingredients to suit your particular dietary whim. Using our doughnut maker this recipe made 2 dozen. In a medium bowl, whisk together 2 cups Einkorn flour, 3/4 cups coconut sugar, 2 tsp baking powder, zest of an orange (save a little for the glaze), and a few twists from your pink salt grinder. In a second bowl beat 2 eggs, 1/2 cup milk, a couple tablespoons of melted butter, and juice of the orange. Mix the liquid into the dry and you’re ready to make doughnuts. Make a glaze by whisking milk into a cup of powdered sugar until it’s a good sticky consistency. Add a little zest. Pour into your doughnut maker or google cooking time and temp for a doughnut pan. 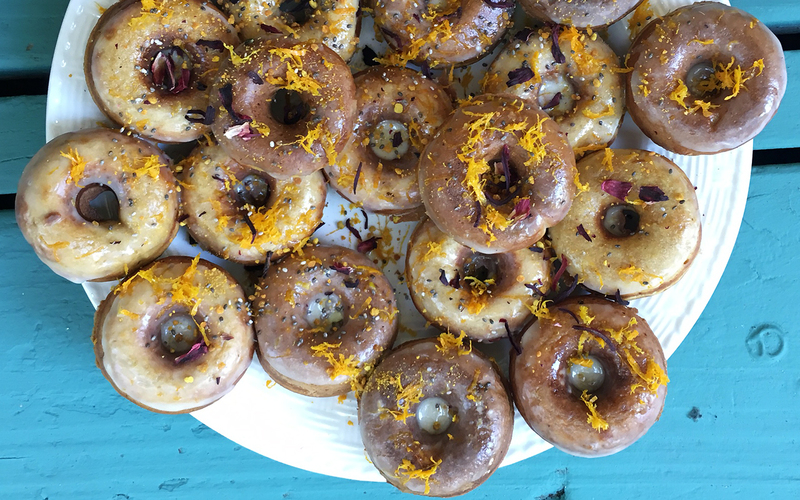 Once they’re cool, dip in the glaze and top with zest, chia seeds, bee pollen, dried hibiscus, or whatever suits your fancy. I made a second batch for our son, gluten and dairy free by substituting buckwheat flour, coconut oil, and coconut milk. Ingredient list is down below. Mix the ingredients together and store in a jar for future use. If you just want to make enough for this recipe use 1/2 tsp soda, 1/2 tsp arrowroot, 1 tsp cream of tartar. Thanks for the substitute ideas. I never know about the gluten and the lack thereof how a baked good will turn out. I don’t bake much any more but this sounds like a treat for every now and again.